The wait is over! The wait that lasted 16 years (Return of the Jedi was released in 1983). And now, finally, the Prequel trilogy begins. Of course, I had to see it on opening day. And before I saw the first showing, I already had tickets to see it again (on that following Saturday). In fact, I plan to see it many times before it leaves the theater. It's just that good. And what's more, to me (and to many others of my generation, I am sure) this movie allows me to fill a great void and need, enabling me to recapture some of that wonder and excitement that has been lost since my childhood. And I love the script! It opens up so much in the whole story of STAR WARS. And it fits perfectly like a puzzle piece into this legendary saga. We are taken back, before Luke Skywalker was born, and when Darth Vader was an 8-year-old mama's boy known as Ani (short for Anakin). The story of Anakin Skywalker is in itself the most intriguing story yet to be told. How often is it that we see "the bad guy" in his innocence of youth? Never, or almost never (there is always an exception, I guess). And yet, it is so true. Just think. Everyone who can be personified as the epitome of evil, be it a character such as Darth Vader, or a living being, such as Adolf Hitler, was at one point innocent and pure. What is it that makes one evil? This is one of the questions to be answered with this Prequel Trilogy. And to those captious critics who so wrongfully have not given this movie the praise that it deserves, I must say a few things. First of all, the greatness of this movie and of the entire STAR WARS saga is something that will outlast this generation and the next. To be so quick as to put this movie down is pure foolishness. This movie needs to be seen in the context of the entire saga. But even on it's own, I say that this movie is one in a million. Secondly, the characters were, and are (remember, it's a trilogy) developed just fine. I have read much about STAR WARS and to me everything fit perfectly. I felt that the added mystery of where Qui-Gon, Palpatine, and Darth Maul came from was needed to enhance the aura of the film. To me, the movie was perfect. And what's more, STAR WARS is primarily a visual extravaganza, as is evidenced by the vast array of alien beings whose physiques would to most of us be unimaginable without the benefit of viewing a film such as this. And referring to the "aura" of the film, I would like to elaborate. The movie is set in a time where crime and social unrest are nearly unheard of, and the Jedi are the peacekeepers of the universe. 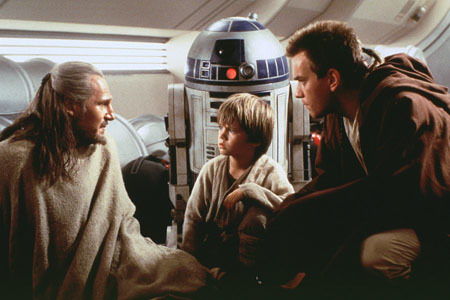 The calm and cool confidence of these Jedi is demonstrated perfectly by Qui-Gon Jinn (Liam Neeson) and his apprentice, Obi-Wan Kenobi (Ewan McGregor). They are the perfect role models, demonstrating courage, wisdom, and honor. As this first episode evolves, however, we see that there are new forces of evil that are (and will be) rising up. It is very similar to the Renaissance era giving way to the Dark Ages, and it is quite an eery feeling once this facet of the movie is realized. 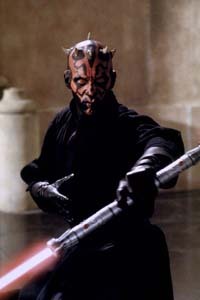 And the face of evil is easily seen in the nightmarish face of Darth Maul (Ray Park). However, what is truly unnerving about this film is that Darth Maul is meerly an apprentice of a more powerful evil figure, Darth Sidious (who is later known as the Emperor). Equally chilling is the fact that Darth Sidious (Ian McDiarmid) is not so easily recognizable; in fact, he is a trusted member of the Senate. This is somehow even more frightening: the fact that such a dangerous evil figure can be trusted and loved and disguised to the extent that he is not seen for what he really is. This is quite analogous to my ex-fiancee, but I won't get into that now. My favorite part? It was definitely when the red shield was separating Qui-Gon and Darth Maul. 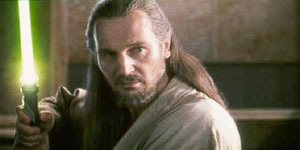 While Darth Maul was pacing back and forth like a caged animal, Qui-Gon knelt down to meditate, showing yet again, his wisdom, composure, and courage. This one scene, to me, seems to capture the essence of the film. As a child, and still today as well, I always had a crush on Princess Leia. She had a beauty to her that I could never tire of watching, especially her lips. I am pleased to report that this prequel trilogy will have a lead female character just as stunning and appealing. She is younger, but more regal, and, at the same time, more down-to-earth. 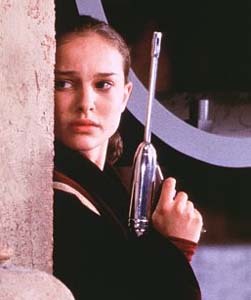 She is Queen Amidala (played by the captivating teenager, Natalie Portman). 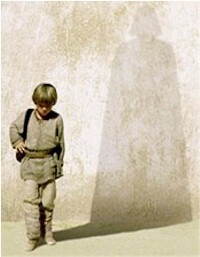 As for Anakin (Jake Lloyd), I was extremely impressed. I have heard many complain about how he was too immature at times. Anakin is an EIGHT-YEAR-OLD boy! And the movie highlights this fact perfectly. He is a child prodigy, with immense potential, but he is still a boy. Jar-Jar Binks: a purely digitally animated/created character. I was worried going in that Jar-Jar would be too fake looking and that his unrealism would detract from the movie. However, I am pleased to report that this is not the case. In fact, his character is perhaps the greatest special-effect accomplishment of the movie. And speaking of these special effects, I was both amazed and, at the same time, didn't notice. There are scenes in which the entire screen (or most of it) has been digitally created. When I say that I was amazed, I mean that some of the effects are just breathtaking to look at. And when I say that at times I didn't notice, it is because I was not thinking about special effects at the time...I was there. This is perhaps the greatest tribute to Lucas and his crew: the fact that they are able to take us to another world, completely made up, with characters and vehicles and whole worlds (see Naboo) that don't exist, and yet we, the audience, can see and experience all of it by watching the film. 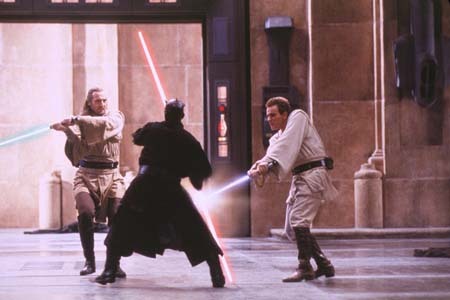 And while I am mentioning the visual aspects of the film, I simply MUST pay homage to the lightsaber fight scenes. Just seeing this was worth every penny, in my book. I have read how there was much training and choreography that went into these scenes by leading martial arts experts. The end result is spectacular! It just blows me away every time I see it. And the double lightsaber is just the coolest thing that I have ever seen! And listening to the film is just as enthralling. The sound effects are, as usual, top notch. But the music is what I am most impressed with. I am listening to it now. John Williams has written a masterpiece once again. A small portion of the soundtrack comes directly from the original trilogy, which is a must (especially for the opening scene of the film). What is even more captivating is what he has done with "Anakin's Theme". It is a happy melody, fitting for a boy serving as one of this movie's heroes. 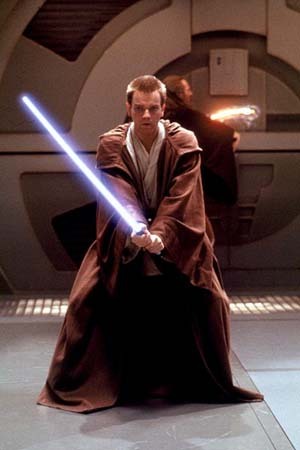 However, if you listen closely, you can hear, in the bass region of the music, a hint of what Anakin is to become. It is the Imperial March (Darth Vader's Theme). Is is softer and slower, but it is there nevertheless. And it is both fascinating and eery to listen to. There are other moments in the soundtrack, too, where themes from the original trilogy seem to pop up at times. It is simply enchanting. I could go on and on explaining every little detail from this movie that makes me love it more and more, but I don't need to write a book here (by the way, I purchased Terry Brooks' novelization of the movie, which I am reading now and which seems to delve deeper into the story, characters, and plot than the movie could have possibly had time for). Besides, what would be much more enjoyable for you is to go see The Phantom Menace. 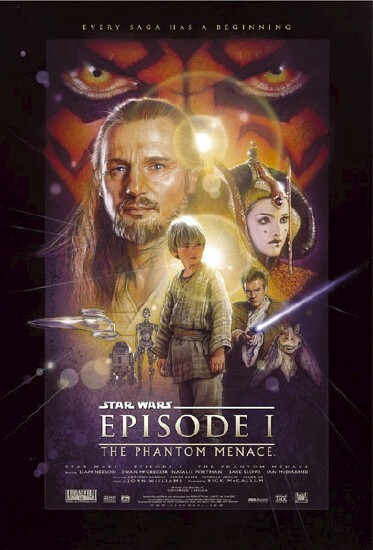 How would you rate the movie STAR WARS: Episode I -- The Phantom Menace? There have been 54142 people to visit this page since Wed, May 19, 1999. And you are the first person to visit this page today!